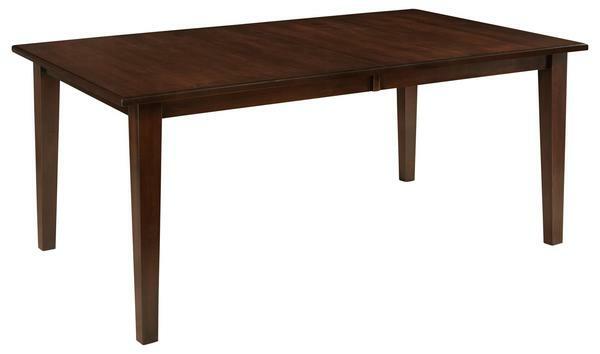 Handcrafted in the heart of Amish country, our Roanoke Leg Table is made to last generations. The streamlined look features a clean-edged top paired with a Shaker-style skirt and tapered legs that combine to give you a versatile piece that can be matched to any decor. Available in a variety of sizes, with your choice of up to eight extensions, the Roanoke table can be customized to fit your unique dining room - and expandable enough to fit all your guests. Choose from classic Brown Maple, Cherry, or Oak, or choose an exotic Elm or Walnut for the construction of the Roanoke table. From there, you can choose from an array of finish options to get the perfect tone to suit your tastes. Available edge styles let you add a bit more customization to this table to make it your own. Check out online by choosing your preferred options or call one of our furniture specialists today to help you in the process. Each piece is made to order from your specifications and delivered with care to your home for one flat fee. So don't forget to pair your new table with the Roanoke dining chairs or another unique Amish dining chair to complete the look. *42" and 48" wide table can store 2- 12" leaves with and 2- 12" leaves without the skirt. Please add self-storage if you would like to self-store. * When you add 3-8 extensions a center leg will be added to the table. If you add 9 extensions 2 center legs will be added.